Gottfried Wilhelm Leibniz (also Leibnitz or von Leibniz) (July 1, 1646 - November 14, 1716) was a German polymath, deemed a universal genius in his day and since. Educated in law and philosophy, and serving as factotum to two major German noble houses, Leibniz played a major role in the European politics and diplomacy of his day. His work touched on nearly every subject imaginable, from logic and mathematics to civil engineering and politics. Philosophers today see him as representing one of the peaks of early modern rationalism, with his conviction that reasoning was capable of revealing all truths of the universe. Leibniz attempted to establish a universal, integral, and unified system of thought that can be applicable to diverse areas in order to unify all partial truths dispersed into different areas. Leibniz strove for the unity of knowledge not by reductionism but by a metaphysical approach within which harmony is established among diverse components. His thoughts contain rich innovative insights that are yet to be studied and explored today. Leibniz's life was mainly spent working for various German nobles. Though such a career may have kept him from producing the sort of grand treatise characteristic of most great early modern philosophers, it allowed him to travel extensively in Europe, encountering (and influencing) many of the best minds of his day. Leibniz was born on July 1, 1646, the child of Friedrich Leibnütz and Catherina Schmuck. He began spelling his name "Leibniz" early in adult life, but others often referred to him as "Leibnitz," a spelling which persisted until the twentieth century. When Leibniz was six years old, his father, a Professor of Moral Philosophy at the University of Leipzig, died, leaving a personal library to which Leibniz was granted free access from age seven onwards. By age 12, he had taught himself Latin, a language he employed freely all his life, and had begun to study Greek. He entered his father's university at 14, and completed his university studies by age 20, specializing in law and mastering the standard university course of classics, logic, and scholastic philosophy. However, his education in mathematics was not up to the French and British standard of the day. In 1666 he completed his habilitation thesis (which would allow him to teach), On the Art of Combinations. When Leipzig declined to assure him a position teaching law upon graduation, Leibniz submitted to the University of Altdorf near Nuremberg the thesis he had intended to submit at Leipzig, and obtained his doctorate in law in five months. He then declined an offer of academic appointment at Altdorf, and spent the rest of his life in the service of two major German noble families. Leibniz's first position was as a salaried alchemist in Nuremberg, an area he remained interested in for the rest of his life. He soon met J. C. von Boineburg, a diplomat of the Bishop Elector of Mainz, Johann Philipp von Schönborn. Von Boineburg hired Leibniz as an assistant, and shortly thereafter introduced Leibniz to the elector. Von Schönborn soon hired Leibniz as well as a legal and political adviser. Von Boineburg did much to promote Leibniz's reputation, and the latter's memoranda and letters began to attract favorable notice. Leibniz's service to the Elector soon took on a diplomatic role. The main European geopolitical reality during Leibniz's adult life was the ambition of the French king, Louis XIV, backed by French military and economic might. This was especially worrisome for the German states, who had been left exhausted, fragmented, and economically backward by the Thirty Years' War. Leibniz helped von Boineburg devise a plan to protect German-speaking Europe by distracting Louis. France would be invited to take Egypt as a stepping-stone towards an eventual conquest of the Dutch East Indies. Having directed it's military might at Egypt, France would have too few resources to attack Germany. This plan obtained the Elector's cautious support. In 1672, Leibniz was sent to Paris to present the idea to the French, but the plan was soon overtaken by events and became moot. Napoleon's failed invasion of Egypt in 1798 can perhaps be seen as an unwitting implementation of Leibniz's plan. Thus Leibniz began several years in Paris, during which he greatly expanded his knowledge of mathematics and physics, and began contributing to both. He met Nicolas Malebranche and Antoine Arnauld, the leading French philosophers of the day, and studied the writings of Rene Descartes and Blaise Pascal, unpublished as well as published. He befriended a German mathematician, Ehrenfried Walther von Tschirnhaus; they corresponded for the rest of their lives. Especially fateful was Leibniz's making the acquaintance of the Dutch physicist and mathematician Christiaan Huygens, then active in Paris. Soon after arriving in Paris, Leibniz received a rude awakening; his knowledge of mathematics and physics was spotty. With Huygens as mentor, he began a program of self-study that soon resulted in his making major contributions to both subjects, including inventing his version of the differential and integral calculus. In 1673 Leibniz made a brief trip to London. There he made the acquaintance of Henry Oldenburg. Oldenburg was then the secretary of the Royal Society, who was particularly impressed by a calculating machine Leibniz had invented—one that could perform all four arithmetical operations. That same year, Leibniz was elected a fellow of the Society. When Leibniz returned to Paris, however, he found himself unemployed (both von Boineburg and von Schönborn had died by 1673). He had hoped for employment by the Paris Academy, but soon realized that it would not be forthcoming (he was finally accepted in 1700). He therefore somewhat reluctantly accepted a post as councilor at the court of Hanover for Duke Johann Friedrich of Brunswick-Lüneburg. Leibniz managed to delay his arrival in Hanover until the end of 1676, after making another short journey to London. On the journey from London to Hanover, Leibniz stopped in The Hague where he met Anton van Leeuwenhoek, the discoverer of microorganisms. He also spent several days in intense discussion with Baruch Spinoza, who had just completed his masterwork, the Ethics. Leibniz respected Spinoza's powerful intellect, but was dismayed by his conclusions that contradicted Christian orthodoxy, and found many of his proofs unsound. In the service of the House of Brunswick (also: Braunschweig), Leibniz was engaged in a wide variety of projects. He attempted a number of complicated mechanical schemes for draining a series of mines in the Harz Mountains (none of which appeared to have been successful). He was assigned the massive task of compiling a history of the Guelph lineage (of which the House of Brunswick was a part), as a means towards furthering the family's aspirations. The Duke also enlisted Leibniz's legal and philosophical expertise in attempting to reunite the Protestant churches with the Catholic Church. Finally, Leibniz began producing the first mature expressions of his philosophy (beginning with the Meditations on Knowledge, Truth and Ideas of 1684). The rest of Leibniz's life was occupied with various tasks associated with Hanover. He never produced the requested history of family, but nevertheless examined numerous archives and compiled much preparatory material. He traveled constantly to various courts throughout Europe, and was able to establish an Academy of Sciences in Berlin while initiating the formation of similar societies in Vienna and St. Petersburg. Despite a large number of municipal and legal projects, he maintained an extensive correspondence on nearly every topic imaginable (around 15,000 of his letters survive). It is therefore not surprising that his relations with his employers became somewhat strained, and when Duke Georg Ludwig was crowned George I of England, the family moved while leaving Leibniz in Hanover. The last years of Leibniz's life were not happy ones. Abandoned by the House of Hanover, he made some final attempts at completing the family history and compiling an authoritative expression of his philosophy. Neither attempt was successful. He died in November of 1716. Leibniz is credited, along with Isaac Newton, with inventing the infinitesimal calculus. According to Leibniz's notebooks, a critical breakthrough occurred on November 11, 1675, when he employed integral calculus for the first time to find the area under the function y = x. He introduced several notations used to this day, for instance the integral sign ∫ representing an elongated S, from the Latin word summa and the d used for differentials, from the Latin word differentia. Leibniz did not publish any of his results until 1684 (two years prior to Newton's Principia). The product rule of differential calculus is still called "Leibniz's rule." Leibniz's approach to the calculus fell well short of later standards of rigor (the same can be said of Newton's). We now see a Leibniz "proof" as being in truth mostly a heuristic hodgepodge, mainly grounded in geometric intuition and an intuitive understanding of differentials. Leibniz also freely invoked mathematical entities he called infinitesimals, manipulating them freely in ways suggesting that they had paradoxical algebraic properties. George Berkeley, in a tract called The Analyst and elsewhere, ridiculed this and other aspects of the early calculus, pointing out that natural science grounded in the calculus required just as big of a leap of faith as theology grounded in Christian revelation. Modern calculus emerged in the nineteenth century, and banished infinitesimals into the wilderness of obsolete mathematics (although engineers, physicists, and economists continued to use them). But beginning in 1960, Abraham Robinson showed how to make sense of Leibniz's infinitesimals, and how to give them algebraic properties free of paradox. The resulting nonstandard analysis can be seen as a great belated triumph of Leibniz's mathematical and ontological intuition. From 1711 until his death, Leibniz's life was envenomed by a long dispute with John Keill, Newton, and others, over whether Leibniz had invented the calculus independently of Newton, or whether he had merely invented another notation for ideas that were fundamentally Newton's. Today, the predominant view is that Newton developed his calculus first, then mentioned to Leibniz several things that his new method could accomplish (without specifying anything about the method itself). Leibniz took this cue to develop his own calculus, which he published quickly, perhaps with less-than-admirable motives. Series 1. Political, Historical, and General Correspondence. 21 vols., 1666-1701. Series 2. Philosophical Correspondence. 1 vol., 1663-85. Series 3. Mathematical, Scientific, and Technical Correspondence. 6 vols., 1672-96. Series 4. Political Writings. 6 vols., 1667-98. Series 5. Historical and Linguistic Writings. Inactive. Series 6. Philosophical Writings. 7 vols., 1663-90, and Nouveaux essais sur l'entendement humain. Series 7. Mathematical Writings. 3 vols., 1672-76. Series 8. Scientific, Medical, and Technical Writings. In preparation. Some of these volumes, along with work in progress, are available online, for free. Even though work on this edition began in 1901, only 22 volumes had appeared by 1990, in part because the only additions between 1931 and 1962 were four volumes in Series 1. When Leibniz died, his reputation was in decline. Many thought of him primarily as the author of Théodicée, whose supposed central argument Voltaire was to lampoon in his Candide. Leibniz had an ardent disciple, Christian Wolff, who briefly generated much enthusiasm for 'Leibnizian-Wolffian' philosophy, only to become a principal target of Kant. Much of Europe came to doubt that Leibniz had invented the calculus independently of Newton, and much of his whole work in mathematics and physics was neglected. His work on law, diplomacy, and history was seen as of ephemeral interest. The vastness and richness of his correspondence went unsuspected. Leibniz's long march to his present glory began with the 1765 publication of the Nouveaux Essais, which Kant read closely. In 1768 Dutens edited the first multi-volume edition of Leibniz's writings, followed in the nineteenth century by a number of editions, including those edited by Erdmann, Foucher de Careil, Gerhardt, Gerland, Klopp, and Mollat. Publication of Leibniz's correspondence with notables such as Antoine Arnauld, Sophia of Hanover, and her daughter Sophia Charlotte of Hanover, began. In 1900, Bertrand Russell published a study of Leibniz's metaphysics. Shortly thereafter, Louis Couturat published an important study of Leibniz, and edited a volume of Leibniz's heretofore-unpublished writings, mainly on logic. While their conclusions have been debated, they made Leibniz respectable among twentieth-century analytical and linguistic philosophers. With analytic philosophy's renewed interest in metaphysics in the 1960s and 1970s, Leibniz's work has received more and more attention. There are at least three challenges in developing a plausible summary of Leibniz's philosophy. First, unlike nearly every other figure in early modern philosophy, Leibniz left no single philosophical work that can be taken as the definite expression of his main thought. Second, Leibniz's views appear differently in different places, not only because of the development of his thought, but also because he often tailored his writings to his audience. Finally, there is the fact of the vastness of the Leibnizian corpus, which is, for all intents and purposes, simply too large for any one person to adequately survey. Despite these challenges, certain themes are particularly noteworthy, both because they recur in what seem to be Leibniz's main philosophical works, and because of their distinctive influence on later philosophers. Unlike Descartes and Spinoza, Leibniz had a thorough university education in ancient and scholastic philosophy, one which he took seriously. His writings show his desire to find some element of truth in each of the various positions. Whereas the Cartesians were eager to abandon the Aristotelian notion of forms, Leibniz attempted to integrate talk of forms into a metaphysics derived from that of Descartes. Leibniz is probably the most important logician between Aristotle and 1847, when George Boole and Augustus De Morgan each published books that began modern formal logic. Leibniz enunciated the principal properties of what we now call conjunction, disjunction, negation, identity, set, inclusion, and the empty set. He also provided some groundwork for what would become epistemic and modal logic. Yet Leibniz's vision of logic was far grander than that of any modern logician; perhaps grander than that of any other figure in the history of philosophy. He proposed the creation of a characteristic universalis or "universal characteristic," built on an alphabet of human thought in which each fundamental concept would be represented by a unique "real" character. More complex thoughts would be represented by combining in some way the characters for simpler thoughts. Leibniz saw that the uniqueness of prime factorization suggests a central role for prime numbers in the universal characteristic. An example of what Leibniz envisioned is as follows: say that the concept 'man' is composed of the more simple concepts 'rational' and 'animal.' Say that to each of the latter a prime number is assigned: 3 and 5. By multiplying these together, we get a number for 'man': 15. If one later wanted to know whether men were animals, all one would have to do is to find whether the number for the later was a factor of the former. 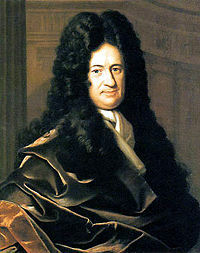 Leibniz envisioned such a means of evaluating the truth of propositions as extending to much more contentious propositions, and thus as a promising means for resolving disputes. Of course, matters would become much more complex with more complex concepts, and one can see Leibniz's interests in establishing academies and developing calculating machines as aimed in this direction. Much of Leibniz's philosophy makes use of two logical-metaphysical principles whose names he coined. Though these principles are present in earlier philosophers, Leibniz makes the most explicit use of them of anyone up to his time. Identity of indiscernibles: Two things are identical if and only if they share the same properties. Principle of Sufficient Reason: There must be a sufficient reason, often known only to God, for anything to exist, for any event to occur, for any truth to obtain. Both of these principles correspond closely to aspects of Leibniz's metaphysics. Leibniz's best known contribution to metaphysics is his theory of monads, as exposited in his Monadology. Roughly speaking, monads are to the mental realm what atoms were seen as being to the physical. While making use of the analogy with atoms, however, Leibniz argued that matter was infinitely divisible, and so denied that physical atoms exist (Leibniz in fact sometimes argued first that there must be monads, and then established that such monads could not be extended). Monads, along with God, are the ultimate elements of the universe. The monads are "substantial forms of being" with the following properties: they are eternal, indecomposable, individual, active, subject to their own laws, causally independent of one another, and each reflecting the entire universe in a pre-established harmony. The ontological essence of a monad is its irreducible simplicity. Unlike extended substances as conceived by Descartes, monads possess no material or spatial character. They also differ from Cartesian extended substance by their complete mutual independence, so that interactions among monads are only apparent. Instead, by virtue of the principle of pre-established harmony (see below), every modification of any monad in the universe was matched by some corresponding modification in every other monad in the universe. Each monad can then be said to 'mirror' the entire universe. Leibniz believed that each monad was metaphysically independent of everything else in the universe, save God. This independence is both ontological and causal. As long as God continues to preserve it, any particular monad could continue to exist while all others are destroyed. Further, no monad is capable of causally affecting another monad, or being affected. Such a view raises an obvious question: if (as Leibniz held) my mind and body are both monads, why is it that they appear to affect each other. For instance, when I choose to raise my arm, my arm lifts, and when I jam my toe, I experience a certain sensation. Descartes had explained such correlations in terms of genuine causal interaction (via the pineal gland). Many of Descartes' successors found such interaction unintelligible, though, and by Leibniz's time the main alternative was the occasionalist view most prominently advanced by Malebranche. Occasionalism held that, in all such cases, the causal force came directly from God. Leibniz, however, claimed that occasionalism made causation unacceptably mysterious, with the universe filled with 'miracles.' He saw the Principle of Sufficient Reason as requiring that every change a substance undergoes be explicable in terms of that substance's own essence. On this basis, he formulated an alternative he dubbed 'pre-established harmony.' This view held that, at creation, each substance was essentially programmed by God to undergo all the changes it would ever go. Throughout its existence, then, its changes were merely the result of the unfolding of its nature. In virtue of this, all substances are coordinated in their changes, such that it appears to them that interaction is occurring. The Théodicée tries to justify the apparent imperfections of the world by claiming that it is optimal among all possible worlds. It must be the best possible and most balanced world, because it was created by a perfect God, who is omnipotent and omnibenevolent. It is on this basis that Leibniz believed all monads were coordinated, despite their causal independence. Moreover, many facts about the world could only be known via considering the Principle of Sufficient Reason in combination with knowledge that this world is the best possible. The statement that "we live in the best of all possible worlds" drew scorn, most notably from Voltaire, who lampooned it in his comic novel Candide by having the character Dr. Pangloss (a parody of Leibniz) repeat it like a mantra. Thus the adjective "panglossian," describing one so naive as to believe that the world about us is the best possible one. AG = Ariew & Garber 1989. LL = Loemker 1969. W = Wiener 1951. WF = Woolhouse and Francks 1998. The year shown is usually the year in which the work was completed, not of its eventual publication. 1666. De Arte Combinatoria (On the Art of Combination). Partially translated in LL §1 and Parkinson 1966. 1684. Nova methodus pro maximis et minimis (New Method for maximums and minimums). Translation in Struik, D. J., 1969. A Source Book in Mathematics, 1200-1800. Harvard University Press: 271-81. 1686. Discours de métaphysique]]. Martin and Brown (1988). Jonathan Bennett's translation. AG 35, LL §35, W III.3, WF 1. 1714. Monadology. Nicholas Rescher, trans., 1991. The Monadology: An Edition for Students. University of Pittsburgh Press. Jonathan Bennett's translation. Latta's translation. AG 213, LL §67, W III.13, WF 19. 1765. Nouveaux essais sur l'entendement humain. Completed 1704. Remnant, Peter, and Bennett, Jonathan, trans., 1996. New Essays on Human Understanding. Cambridge University Press. W III.6 (part). Jonathan Bennett's translation. Strickland, Lloyd (trans.). 2006. Shorter Leibniz Texts. Continuum Books. ISBN 0826489516. Online. Wiener, Philip. 1951. Leibniz: Selections. Scribner. Regrettably, out of print and lacks index. MacDonald Ross, George. 1984. Leibniz. Oxford University Press. Loemker, Leroy. 1969a. "Introduction" to his Leibniz: Philosophical Papers and Letters. Reidel: 1-62. MacDonald Ross, George. 1999. "Leibniz and Sophie-Charlotte" in S. Herz, C. M. Vogtherr, and F. Windt (eds. ), Sophie Charlotte und ihr Schloß. München: Prestel: 95–105. English translation. Couturat, Louis. 1901. La Logique de Leibniz. Paris: Felix Alcan. Donald Rutherford's English translation in progress. Lenzen, Wolfgang. 2004. "Leibniz's Logic," in D. Gabbay and J. Woods (eds. ), Handbook of the History of Logic, Vol. 3. North Holland: 1-84. A remarkable and regrettably expensive one-stop collection of many valuable articles. This page was last modified on 27 June 2017, at 16:19.